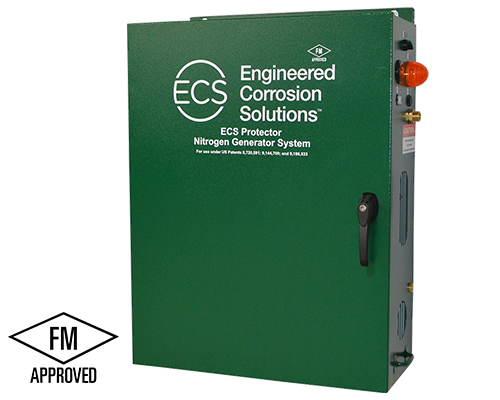 Existing buildings and small dry or preaction systems require a corrosion management system that works with you at fighting nitrogen production corrosion. Don’t sacrifice quality for compact size – get up to 2,000 gallons of capacity in a generator the size of an electrical panel. Monitor your generator with the built-in contacts. Forget the air dryer and the storage tank – when your generator produces ultra-dry nitrogen on-demand, why waste valuable floor space when you can buy one of these space-saving wall-mount nitrogen generators. FM Approved and UL 508A Listed, our equipment meets all applicable standards and is fully compatible with both new and existing nitrogen generator systems. *Based on meeting 30 minute fill requirement at 40 psi.